Compiled by: Jill Gattens, Karuga Koinange, Billy Owens, Casey Collins, Desmond Boyle and Muhammad Waheed. Towson men’s lacrosse enters the 2018 season looking to secure its fourth consecutive Colonial Athletic Association (CAA) Championship. The Tigers return an experienced defense with junior Chad Patterson and senior Sid Ewell on the back line. Last season, Patterson was named to the CAA All-Tournament Team, while Ewell was named Second Team All-CAA and recorded 12 turnovers. Though the defense remains intact, the team had to replace its main attackers during the offseason. The progression of the young offense will be a key component in building success. The team will need to develop a good rapport quickly in order to perform well in non-conference play. Towson will face a myriad of tough teams in late March with matches against Ohio State, Duke and Denver. “It’s a good challenge for our guys the way our schedule shakes out, and we’re looking forward to those opportunities,” Nadelen said. Despite an unproven roster with just eight seniors, Nadelen looks at the difficult schedule as a growing opportunity for the crop of young players. 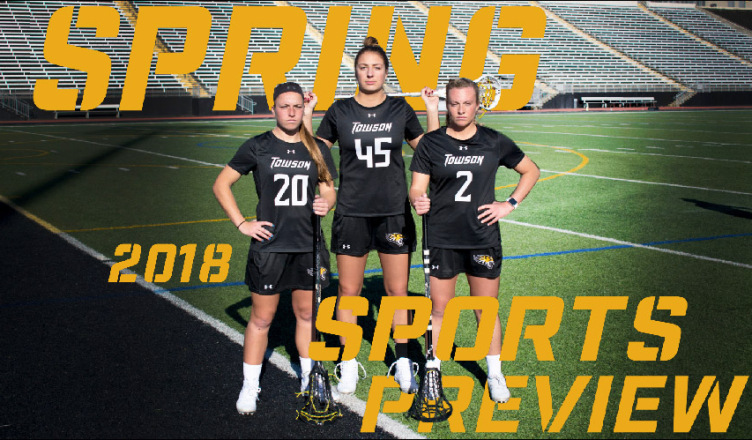 Towson women’s lacrosse made another postseason appearance last year, but were bounced in the first round of the NCAA Tournament. Despite its early exit, Head Coach Sonia LaMonica knows that the team can go much further this season. Seniors Tianna Wallpher, Emily Gillingham and Kaitlyn Montalbano were named team captains for the 2018 season. The three veterans look to pass along their knowledge to the younger players on the team. The Tigers will need that veteran leadership, as LaMonica has a young crop of recruits who look to contribute in future seasons. The impact of the team’s freshman class is showing early, as attacker Kaitlin Thornton has already secured a starting spot. Thornton recorded her first career goal Saturday, Feb. 10, when the Tigers defeated No. 15 Penn State 14-13 at Johnny Unitas Stadium. The team will need its youth to continue to be productive as they will face No. 2 Stony Brook and No. 4 Florida in consecutive weeks during mid-March non-conference competition. Towson also faces conference opponent Elon, and crosstown rivals Johns Hopkins and Loyola later in the season. Competition will be difficult as all two of these three opponents are receiving votes in the Inside Lacrosse Poll rankings. Under the new leadership of Head Coach Matt Tyner, Towson looks to improve in all areas of the game as another season begins. The team is looking to better its record from last year’s 20-34 campaign. Towson would also like to win more conference games this season. Last year, the team finished just 6-18 in CAA play. The Tigers opened their 2018 season with a three-game road series at New Mexico State Feb. 17-18. The Tigers came away with one win in that series. Towson also faces Virginia; University of Maryland, Baltimore County; and University of Maryland, College Park on the road this season. The Tigers host Delaware, Hofstra, College of Charleston and James Madison in CAA play at John B. Schuerholz Park later in the year. During the offseason, the team emphasized endurance and power with the help of Strength and Conditioning Coach Justin Houng. The Tigers are an upperclassmen-dominated squad with senior pitcher Michael Adams, redshirt junior pitcher Alex Cuas, junior shortstop Richie Palacios and redshirt junior outfielder Mark Grunberg returning. Palacios was named an Honorable Mention Preseason All-Colonial Athletic Association selection earlier this month. Although Towson is gunning to win as many games as it can this season, the team is ultimately looking to work on its fundamentals. Second-year Head Coach Jamie Peterson worked with his team to come up with two goals for the 2018 spring season: Win 18 matches, and get to the final round of the Conference Championships in April. Peterson, who served as Interim Head Coach last season, said he is much more comfortable coaching this year since he already has an idea of what to expect throughout the spring. Some of the changes that Peterson has made since the fall include doing more video work with the use of GoPro cameras to record and watch matches, as well as helping the team understand how nutrition and other things off the court directly impact their performance. The team also now works with strength and conditioning coach Joe Alexander. “[Joe] gets some credit, the girls really like him and he’s been working them hard,” Peterson said. With five of the team’s nine players being seniors, Peterson has mostly finished the recruiting process for the fall to bring in four new players to fill the upcoming vacancies. Picking the match lineups this season, though, is tough enough, which he credits to the team’s depth. The team has already played five matches this spring and currently holds a 3-2 record, but its toughest tests are ahead of them. One notable match is March 2, against CAA rival James Madison. “James Madison has had our number every year, and the girls seem to get a little overwhelmed by them, but if they can mentally overcome that, it’d just be huge,” Peterson said. Another big matchup is April 7, at William & Mary, one of the best teams in the CAA. The Tigers have six home matches scheduled to be played on campus at the Tiger Tennis Complex later this spring, with the first coming March 25 against Rhode Island. Near the end of the season, the team will face several conference opponents within days of each other, including a potentially tough home match against Delaware on April 11. Some coaches might be concerned about their players being too fatigued to perform at their best at such a critical point in the season, but not Peterson. Towson track and field will transition from indoor to outdoor March 15, at the 49er Classic in Charlotte, North Carolina, as the team looks to build upon its success from last year. Head Coach Mike Jackson was pleased with his team’s accomplishments from last season, and wants to see his team continue to excel this spring. Junior Lauren Coleman ranked in the top-10 among the entire CAA for her shot put and hammer throw. Senior Ksenia Safonova also qualified as a hammer thrower. The Tigers will rely on veterans like Coleman and Safonova to lead by sharing their wealth of experience. Along with being physically prepared, the Tigers will have to be mentally focused in order to maintain last year’s results. Head Coach Mike Larkin continues his first season with the Tigers, looking to have a victorious debut Feb. 25-26, at the Loyola Intercollegiate in Goodyear, Arizona. Larkin hopes to get off to a strong start this spring after his team concluded its fall season with a top-10 finish in the ODU/OBX Invitational at the Kilmarlic Golf Club in North Carolina. Following the Loyola Intercollegiate, Towson heads to Williamsburg, Virginia, March 25 -27, for the Kingsmill Intercollegiate. Towson struggled in the three-day tournament hosted by William & Mary last season, placing 21st out of 22 teams. The following weekend, the team hosts the Towson University Spring Invitational April 7-8 in Grasonville, Maryland. Towson had one of its most successful weekends of the season in this competition last year, placing second out of 22 total teams. Towson concludes its regular season the next week in the Navy Spring Invitational hosted by the United States Naval Academy, before officially wrapping up the season with the CAA Championships in Raleigh, North Carolina, from April 20-22. The Tigers are led by sophomore Spencer Alexander, junior William Bachelor and freshman Kobdech Rodrat. Those three athletes played in all five events this past fall, and each averaged a score of 72 per-round. Towson women’s golf Head Coach Lisa Ferrero led Towson to top-six finishes in all five of its competitions in her first season with the team in the fall. Ferrero and the Tigers will look to replicate their success in the spring season, which begins Feb. 25, in South Carolina. The team kicks off its season at the Kiawah Island Spring Invitational hosted by the College of Charleston. The event will take place at the Kiawah Island Resort. A few weeks later, the team travels to Fort Myers, Florida, to play in the Spring Break Shootout hosted by Florida Gulf Coast. Later that month, the team heads out west to face Sacramento State in California. The two-day event will take place March 19-20. The Tigers return juniors Alix Lowe and Jenny Buchanan, and senior Alexis Hios. Each athlete played in all five events in the fall, with Lowe posting the best numbers. She shot an average score of 74 per-round with a team-low single round score of 68. Hios and Buchanan also had successful fall campaigns, both averaging 75 strokes per-round with Hios shooting a low round of 69, and Buchanan shooting a low round of 70. The team finishes up its regular season against Navy April 7-8, before competing in the CAA Championships April 13-15 in Southport, North Carolina. Last year, they placed fifth in the competition, the best finish in program history. The Tigers are hoping to make it back to the CAA Tournament after missing out last year for the first time in five seasons. Towson struggled on the road last year, going 6-15 in matchups away from the Tiger Softball Complex. The team also had problems on the mound, as sophomore Julia Smith-Harrington was the only pitcher with a record above .500. Head Coach Lisa Costello knows that in order for Towson to get back to the CAA Championship, pitching will have to improve. Costello also hopes that a more rigorous non-conference schedule will prepare her team better this year for CAA play. Towson opens up conference play this year on the road against two-time defending champions James Madison on March 24. That game should serve as a good test to see how the team will fare in the upcoming conference season. Seniors Shelby Stracher and Kendyl Scott look to provide enough firepower on offense to get Towson back on track. Stracher led the team last season with 11 home runs and has two this season, while Scott led the team with a .341 batting average. Costello knows how important it is for seniors like Scott and Stracher to return to the CAA tournament.